Girls' Generation 'The Boys': Girls’ Generation ‘The Boys’ is Sweeping Various Weekly Music Charts! Girls’ Generation ‘The Boys’ is Sweeping Various Weekly Music Charts! 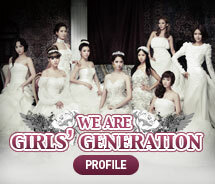 Girls’ Generation proved their power by sweeping various music charts as well as TV music programs. Girls’ Generation the 3rd album title song, ‘The Boys,’ which was released on the 19th, topped weekly charts of various music websites such as ‘Melon,’ ‘Olleh Music,’ ‘Mnet,’ ‘Bugs,’ ‘Soribada,’ etc. Moreover, Girls’ Generation the 3rd album ‘The Boys,’ which was released on the same day, won the 1st place on both daily and weekly charts of count charts for album sales including Hanteo Chart, Hot Tracks, etc. and proved their tremendous popularity. Meanwhile, Girls’ Generation has been performing with the title song, ‘The Boys,’ in earnest.